We are a split family when it comes to dinner choices. My daughter, if she had a choice, would have spaghetti every night… and I would choose to have Mexican every night… and my husband and son will eat just about anything. This meal is the best of pasta and Mexican. It is DELICIOUS! I had my doubts… but let me tell you, everyone in my family LOVED this meal! I have been following your website for quite a while now and have tried many of your recipes with fantastic results, but I was wondering what is enchilada sauce? I've looked everywhere at my local supermarket and couldn't find it anywhere! Thanks! enchilada sauce is in the mexican food isle, usually right next to the salsa and taco shells. it usually comes in a can and is avail in a red or green variety. at my store, they are usually on the top shelf. good luck! Do you live by a Trader Joe's?, they have the best in my opinion. what brand is a good green enchilada sauce? This looks AMAZING! I love that I can just scoop out some of the sauce before adding cheese for my son, he's lactose intolerant. My mouth is watering, I can't wait to try this! Love your new look! This looks like a great recipe, but I"m wondering what I can substitute in place of sour cream and enchilada sauce (two of the ingredients I really don't like). Salsa? Hmm... I'll let you know what I decide. I saw this last night, just in time! I had all of the ingredients on hand, so I gave it a shot. After a long day of work, baseball games, practices, and boy scouts, it was late by the time I got started. In my hurry, I totally forgot to mix in the cheese and sour cream! So I just tossed in the cheese and stirred it in, and skipped the sour cream. Despite my mistakes, my 4 kids and my husband loved it! Will definately be adding this to my recipe book! Thanks! I made this for dinner tonight. It was so good, my husband & I could not stop eating it. Cannot wait to make it for company.. This looks delicious, I'll be making this over the bank holiday weekend! Oh my goodness this was so amazing!!! Thank you for sharing! This was SO spicy, no one in my family could finish it!! I even left out the chili powder because I had a hunch. I used all mild enchilada sauces. and green chili peppers....as I said, I can eat spicy food but this was over the top for even me!! Hold up. Did Chef in Training just post one of my recipes?? I die. So glad you liked it! It's Mr. Spouse's favorite meal!!!! Your picture makes my mouth water...SO much more appetizing than mine! HA!!! This is by far my fav so far! I actually made the chicken and sauce (without the cheese and sour cream) in the crock pot and it came out great. I just had to come home shred the chicken and then add it back to the sauce to add the cheese and sour cream. It came out great! I've made this a few times now and it always turns out delicious! Today I followed a previous poster though and made it in the crock pot and it was SO much easier! I left out the oil and just put all the ingredients, minus the cheese, sour cream and pasta, in with some raw chicken breasts and let it cook on low for 7 hours then shredded the chicken and put it back in the pot til dinner time. When we were ready to eat I added the cheese, sour cream and cooked pasta and stirred it up. Yum! It was a little watery so next time I may do 4 breasts instead of 3 and def up the veggies a bit but other than that I was very pleased at how well it came out considering how little effort I put it. Yum!! I just pinned this. I can see this turning into a pregnancy craving in the near future (that is if this stupid nausea would quit interfering with my cravings lol). I've been craving a lot of Mexican foods with this pregnancy. :-) This sounds delicious! Hey! I am a great fan on of your site, and have made many recipes you post! Here is my question that I hope you can answer quickly.... 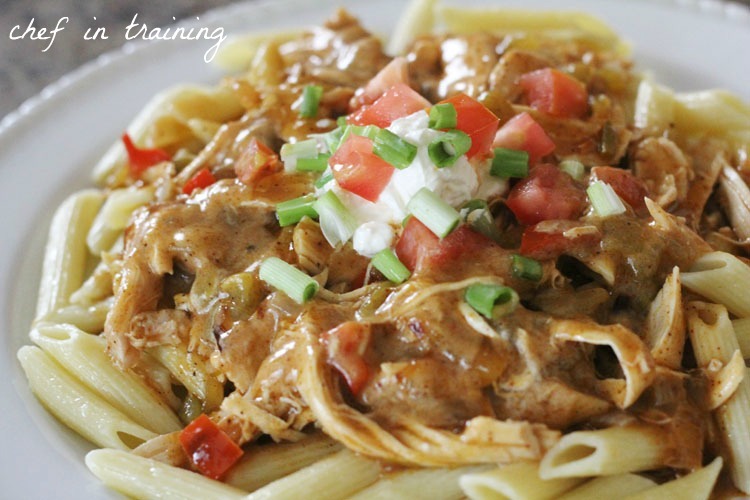 I love the enchilada chicken pasta recipe. I have a good friend having surgery, and I would love me to bring her family a prepared meal they can reheat when ready. So, if I made this entree completely through the sour cream, could I pour it into a metal pan and instruct them to reheat it at 350 degrees covered for maybe 30 minutes without the sour cream cheese sauce curdling? Any suggestions, or do you not recommend this for an oven reheating? I am hoping this is a recipe that would work the day after, but I don't want something that WOULDN'T work! Thanks for any help you can give me! Can you make beef and not chicken in Enchilada Pasta? How many cups of Red Enchilada Sauce? It was so good. I did not put red bell pepper or green enchilada sauce because I accidently bought green salsa. I will try that next time.